Copyright 2000 Rommie J. Walker, October 2000 All rights reserved. Approximately 41 known individuals were on this journey. My relationship to this wagon train is through my wife Darla Sue Howard Walker. Darla's parents knew that her great grandparents, Linus and Lucinda Bushnell, arrived in Oregon by way of the Oregon Trail but did not know the year or details of the journey. So my journey began to find out how the Bushnell family arrived in Oregon, who was in the family, did they have any children, how old were they and one question usually led to two more unanswered. In 1993 and 1994, I wrote my first paper that really started me researching for more details. More questions come to mind when considering this migration from Burr Oak Ridge (Tipton), Cedar County, Iowa 140 years ago. As each is answered, another is raised such as who was on this wagon train? Why did they come? What route did they take? What hardships might they have endured? Where did they settle? What happened to them as the years pass? Who are their descendants? Some answers have been found and combined here to create a picture of what might have been. Sources surely remain to be located and reviewed to verify or disprove this representation. Between 1994 and 1999, I attempted to identify as many descendants of the families on the Bushnell Wagon Train as possible. This has been a very rewarding experience and I have met in person or through the mail or Internet, some very nice and helpful people that have freely shared information and stories of their ancestors. At present I have about 1,000 individuals named in the database which are direct descendants of this wagon train. I have another 400 to 500 names I have not entered or merged from other files to mine. This attempt to identify members of this Oregon Trail Wagon Train of the Bushnell family and others is with the information found in conversations and written records. Many wagon train diaries exist in archives and it is my hope to locate one some day for this family wagon train. I understand Alfred Collver had a diary, which was lost in a fire in 1902. I also believe John A. Harry may have had a diary as one of the articles found did mention he kept a diary and even had a few notes in the article. So maybe all is not lost and something more will turn up. There may well be errors or incomplete information in this writing and if so, they are with the best of intentions to identify a history of how the Bushnell family arrived in Oregon. In the spring of 1851, ten or more families related in one way or another, made up this wagon train bound for Oregon. They lived in the vicinity of Burr Oak Ridge (to be renamed Tipton) in Cedar County, Iowa, and made the decision to be a part of the western movement and departed Iowa for the six month long journey to Oregon. Why they decided to move to Oregon is not known but free land was being offered for adults that made the journey and filed through Donation Land Claims from the Government of the United States. The Donation Land Claim law (DLC) is reviewed at the end of this paper. In a Horace Rice personal history noted in the Illustrated History of Central Oregon. "In 1851, with his own family, with his mother, stepfather and other relatives, he made the trip across the plains to Oregon". Horace Rice was the son of Mary Polly Pettingill Rice Cook and brother of Nancy Rice Cook, Lucinda Rice Bushnell, Ruth Rice Collver and Mary E. Rice Cook. When she first came to this county, Roseburg did not exist and there was only one house the home of Aaron Rose. (End of excerpt). Other information shows they departed Cedar County, Iowa in the spring of 1851 and arrived in Oregon between June 26 and July 1, 1852. Some of the travelers arrive in October 1851. The age of the traveler's range from the oldest being Mr. Beckwith Cook, 66 years and his wife Mary Polly (Pettingill) Rice Cook, 61 years. There were 19 children, the oldest being about 11 years. There were at least 5 under two years. Four babies were born on the plains or at winter camp in Utah. Those four born on the trail are 1. Horace H. Cook, born 1851/2, on the plains, son of Seley M. and Nancy Cook. 2. Kansas (Candace) H. Smith, born 1851/2, on the plains, daughter of Henry and Sophia (Cook) Smith. 3. Adelia Emily Collver, daughter of Alfred and Ruth (Rice) Collver at Provo, Utah, born January 17, 1852. 4. Alva Sylvester Bushnell, son of Linus and Lucinda (Rice) Bushnell born April 30, 1852 at Provo, Utah. Of the 41 people on this journey nearly one half were young children. 1. Hiram M. Collver, to Douglas Co. from Cuyahoga, Co. Ohio. Born 1834, Arrive Oregon July 1, 1851. Wife not listed. DLC Claim # 718. 2. Hiram Colver (Culver) to Jackson Co. from Union, Co. Ohio. Born 1819, Arrive Oregon Oct 20, 1850. Wife Maria. DLC Claim # 24. 3. Samuel Colver (Culver) to Jackson Co. from Union, Co. Ohio. Born 1817, Arrive Oregon Oct 20, 1850. Wife Huldah. DLC Claim # 83. In 1938, Thankful Bushnell Ollivant remembered "There were many Indians encountered on the way over the plains but they were very friendly and never any serious trouble." and "When on the plains, an old Indian buck bothered her one afternoon when they were making camp for the night. He asked for something to eat and she gave him food. Still he kept at it and would shove his hand under the wagon covers and try to feel around. She knew of course he was trying to steal something and she didn't like it. She was working with a carving knife and as she glanced around, she saw the hand, she slapped it with the knife which turned in her hand, for some cause, and the hand was slashed. It was cut badly as the blood there gave evidence. The Indian did not come around again but the emigrants were worried that it might cause some trouble with the tribe, but none occurred." Thankful was 4 years old when starting this journey in Iowa. The families arrived at Fort Bridger, Wyoming. The main party continued on to Utah for winter camp and separated with Horace Rice, Absalom and Daniel Bolton and probably John A. Harry and possibly Alfred Collver. The Horace Rice contingent decided to continue on to Oregon and traded ox for horses. It is questionable that Alfred Collver went ahead but DLC records indicate he arrived Oregon in the fall of 1851. If Alfred Collver did go on, it appears he left his wife and family in the winter camp as child, Adelia was born to them January 17, 1852 in Utah. This group that traveled on in the fall, suffered much hardship during their journey as it was nearing the end of the travel season. The party was out of food and exhausted when they arrived at Fort Boise. They traded a portion of their bedding for dried salmon skins prepared by the Indians. They dug roots, ate hazel brush and rose balls to keep themselves alive. At Umatilla, they assisted Indians to butcher and dress a steer, which gave them enough meat to last several days. The party arrived at The Dalles where there was a trading post and a tent. From The Dalles to the Cascades the trip was made on the steamer Flint and from there to the mouth of the Big Sandy by bateau (riverboat). From the Big Sandy they went overland to Milwaukee and arrived in Oregon City October 20, 1851. Horace and Eliza Rice obtained work, he in a sawmill at $2.50 a day and she cooking in boarding house for $1.00 a day. He later made from $10.00 to $40.00 per day working in timber and wood. The Horace Rice family suffered from Typhoid Fever while in the Milwaukee/Oregon City area and moved on to Lane County and joined other relatives where they remained several years before relocating to Wasco County in 1863. There is other information to indicate part of this group may have gone by way of the Barlow Road. Beckwith Cook, Seley Cook, Joel Cook, Linus Bushnell, Alfred Collver, Abraham Cutlip and Henry Smith families went on to Provo or Salt Lake City, Utah and established a winter camp. "When they arrived at Salt Lake City where they spent the winter, a Mormon Elder called on Cook, the train captain, and told him that the train had too much stock and supplies and must give the Church its "tithing" tenth of all possessions. Captain Cook refused and explained that the train was only wintering there and would be on its way to the west when winter broke." At least two of the four children born on the Oregon Trail were born in Utah during this winter period. The families continued their journey to Oregon again in the spring of 1852. All the families arrive in Oregon between June 26 and July 8 1852. It is believed they followed the Oregon Trail but there has been some speculation they traveled the Applegate Trail. The families arrived in Oregon City where some remained a few weeks and others for a year or longer. The families all made claims on Donation Land after arriving in Oregon. 1. Beckwith Cook settled claim # 1206, October 25, 1852. 2. Seley M. Cook settled claim # 1204, October 25, 1852. 3. Absalom Bolton settled claim # 1205, 10/15 Aug/October 1, 1853. 4. Henry B. Smith settled claim # 1969, August 23, 1852. 5. Horace Rice settled claim # 3024, August 12, 1853. 6. Joel B. Cook claim # 3011 settled in September of 1852. 7. Abram Cutlip claim # 2600 in Sept 1853. 8. Linus Bushnell claim # 594, in Olalla was settled in November 1854. It is believed the Bushnell family remained in Oregon City for about one year after arriving in Oregon. 9. Alfred Collver claim # 294 was settled August 31, 1852 in the Melrose/Lookingglass vicinity. 11. Daniel Bolton settling claim # 4441 in Wasco County on 1 October 1855. Even when separated by many miles and counties, the families maintained contact with each other for many years after the journey on The Oregon Trail. Most of the families did relocate after establishing their Donation Land Claim. It is reasonable to assume that they sold the claim before moving on to other locations in the county or other counties. The Bushnell family relocated from Douglas County to Oregon City then returned to Douglas County. The Collver family relocated from Douglas County to Coos County in 1857 near Stock Sough on the South Coos River. Horace Rice and Absalom Bolton relocated from Lane County to Wasco County in about 1863 and were very successful in farming and business. Beckwith Cook, Seley Cook and Joel B. Cook families remained in Lane County until sometime after 1860 and Beckwith and Seley Cook relocated to Polk County near Buena Vista or Marion County near Jefferson. Joel Cook died Jun 29, 1867, Coos River, Coos Co. He was killed in a logging accident while falling timber. The Cutlip family is believed to have relocated to Douglas County near Oakland and then to Coos County on Daniels Creek before 1860. The Henry B. Smith family remained on the original Donation Land Claim in Lane County and received final title. Henry Smith died in Lane County in 1865. See additional notes on each individual on the Oregon Trail and children of the adult family members born after arrival in Oregon follow. The Rice / Cook family connections. The Rice/Cook family connections may go back to at least the late 1700's and for sure to the early 1800's and the marriage of Seley Cook and Nancy B. Rice in 1835. William King Rice, first husband of Mary Polly (Pettingill) and father of her children, was born December 30, 1793 in Litchfield, Connecticut (another source gives birth place as Conway, Massachusetts Dec 30, 1792). Mr. Beckwith Cook, 2nd wife of Mary Polly was born August 12, 1785 in Litchfield, Connecticut. It appears reasonable to assume that William King Rice and Beckwith Cook may have been acquainted even in the 1790's. William King Rice and Mary Polly Pettingill were married in New York in 1814. (County unknown). Daughter Nancy B. Rice was born in New York in 1817. Beckwith Cook moved to Onondaga County, New York where sons Seley Mansfield Cook was born in 1812 and Joel B. Cook in 1815. The Rice family was in Portage County, Ohio by 1820, when daughter Mary E. Rice was born. The family remained in Ohio until sometime after the marriage of Seley Cook and Nancy Rice on January 24th, 1835. William King Rice moved his family to a new frontier in New Ottawa, Illinois between 1835 and 1839. They were in Illinois when Joel B. Cook and Mary Rice married May 9, 1839 in LaSalle County. William King Rice died at 45 years of age December 29, 1839 in Ottawa, Illinois. The family remained in Illinois for a short time before moving on to Burr Oak Ridge (Tipton), Cedar County, Iowa arriving by the summer of 1840. Alvira Mary Cook, daughter of Joel and Mary E. Cook was born in March 1840 in Illinois. It appears the Beckwith Cook family made about the same journey, at about the same times, as the Rice family, moving to New York, Ohio, Illinois, Iowa and finally to Oregon. The Beckwith Cook family arrived in Cedar County, Iowa in September 1839 from Ohio. The first winter they built a cabin and three families lived in the one room cabin. Culver's, Mudge's and Cook's. They were all sick that winter. Beckwith Cooks first wife, Sybil Olds Cook died in 1839, Iowa. It does appear the Beckwith Cook family traveled from Ohio with the Culver (Collver) family. The 1840 census in Cedar County was taken in the summer and named heads of household. Included in this list are Mary Rice, Beckwith Cook, Mansfield Cook, Jeb B. Cook, Linas Bushnell. 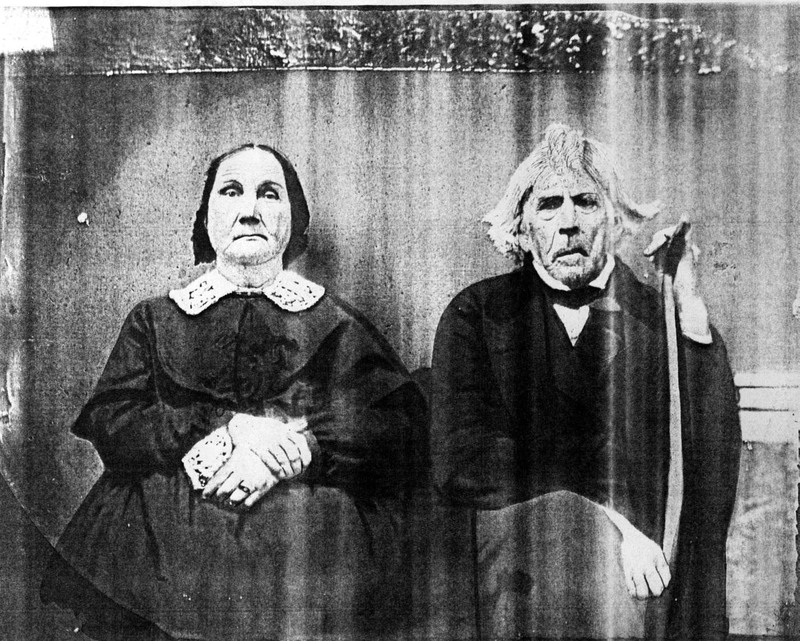 Beckwith Cook and Mary Polly (Pettingill) Rice married January 21, 1841 in Cedar County, Iowa where they remained until they set out for Oregon in March of 1851. The families have been identified to the extent possible at this time. The travelers are in bold print, including children that made the journey. Children born after arrival in Oregon are identified in regular print. An attempt has been made to identify place and date of birth, marriages and when and where the person died. A brief family history is also included with each family. Mary Polly Pettingill Rice Cook is a direct descendant of the first voyage of the ship Mayflower from England in 1620. I have been informed the Cook family is also direct descendants of this same voyage but have not researched the connection. Francis Eaton, born c. 1595 in Bristol, England, came to America in 1620 on the first voyage of the Mayflower, with his wife Sarah and son Samuel. They were listed as strangers on the ship passenger list, which meant they were not Puritans but were members of the Church of England. Sarah, his first wife died soon after arriving in the Colonies. His 2nd wife also died (name unknown) before 1627. He married his 3rd wife, Christian Penn (about or) before 1627 as a son, Benjamin Eaton was born. c. 1627. Being listed as Stranger on the passenger list indicated they were not Puritans but were members of the Church of England. On September 6, 1620, the Mayflower, a sailing vessel of about 180 tons, started her memorable voyage from Plymouth, England with about 100 pilgrims aboard, bound for Virginia to establish a private, permanent colony in North America. Arriving at what is now Provincetown, Mass., on Nov 11 (Nov 21 new style calendar), 41 of the passengers signed the famous "Mayflower Compact" as the boat lay at anchor in that Cape Cod harbor. A small detail of the pilgrims, led by William Bradford, assigned to select a place for permanent settlement landed at what is now Plymouth Mass., on Dec 21. Francis Eaton was one of the signers of the "Mayflower Compact". Other signers included Miles Standish and John Alden , two of the better known in history books. Francis Eaton was a Carpenter and Shipwright. Linus Bushnell age 36, was born in Greene County, New York, March 23, 1815, the son of Constant and Rhoda Baldwin Bushnell. Wife Lucinda (Rice) Bushnell age 27, was born in Portage County, Ohio, October 29, 1825 to William King Rice and Mary Polly Pettingill Rice. The Bushnell family made this journey with five children, one being born en-route. 1. Martin Lewis Bushnell age 7, born 1844 Cedar Co. Iowa, Md. 1. Mary Ann Olmstead on July 12, 1863, and 2. Mary Josephine Swift after 1880. Died Feb. 28, 1926, Tenmile, OR. 2. William Constant Bushnell, age 5, born 1846 Cedar Co. Iowa, Md. Mary Elizabeth Fordney on Feb 13, 1882. Died May 24, 1916, Tenmile, OR. He was run over by an automobile in Roseburg, OR in 1916, which caused his death per Ralph Howard in 1980. 3. Thankful Lucretia Bushnell, age 4, born 1847 Cedar Co. Iowa, Md. Elijah Ollivant of Lookingglass on Jan 1, 1868. Died Oct. 17, 1938 in Olalla, OR. 4. Henry Erastus Bushnell, age 1, born 1850 Cedar Co. Iowa, Md. Kate Jane Lamb. Died about1922. Probably at Olalla or Tenmile OR. 5. Alva Sylvester Bushnell, born in Provo, Utah April 30, 1852. Md. Anna Mary Mitchell, Oct 27, 1889. Died Feb 28, 1934. Lived in Olalla OR in 1920. 6. Edmund Linus Bushnell, born Feb 15, 1857 Oregon City, OR. Md. Mary Persilly Higgins, Feb 12, 1882. Died 1923. He lived in Olalla, OR in 1920. 7. Austin Elmer Bushnell, born Nov 13, 1859 in Tenmile, OR. Md. Mary Casteel Stewart, of Polk County, OR. Nov. 1, 1900. Died March 24, 1929, Tenmile, OR. 8. Ulysses Sylvester Bushnell born July 1864, Olalla, OR. Md. Nanny Higgins of Deer Creek Dec 1, 1884. Died June 4, 1929, Redmond, OR. 9. Adella Deborah Bushnell, born Feb. 15, 1869 Tenmile, OR. Md. Jasper Howard of Tenmile, Sept 26, 1893. Died Feb. 1958, Tenmile, OR. 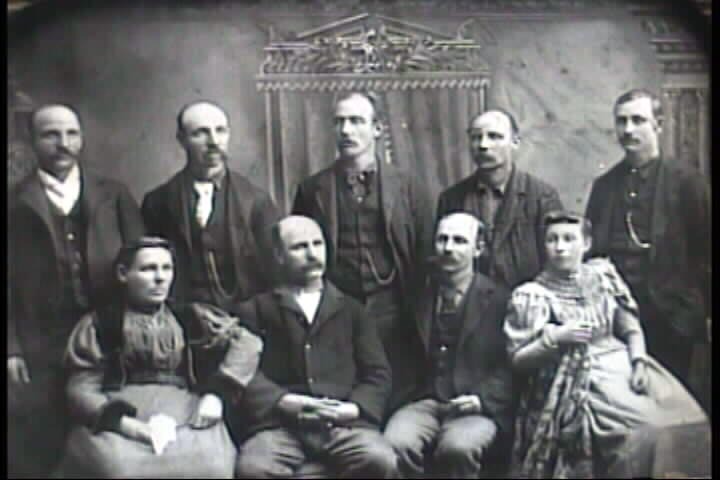 Linus Bushnell family arrived in Oregon July 1, 1852 and settled DLC claim # 594 in Douglas County Nov 6, 1854. This family is counted as being one of the first twenty or so families to settle in the Olalla/Tenmile area. The DLC claimed was up Olalla on what is now Bushnell Creek. The DLC affidavit signers were not listed. Linus sold his Donation Land Claim and later homesteaded the ranch known as the Barnes place. It is believed to be Hidden Valley Ranch in the 1980/90's. Linus Bushnell moved with his parents to Sullivan, New York about 1815 and later to Marshall, Michigan and perhaps to Litchfield, Mich. where he remained until about 16 years of age where he is said to have left home, going to New York state and perhaps later to Ohio. In 1842 he was in Tipton Iowa where he married and some of his children were born. The Bushnell family visited friends and relatives in Oregon City and Lane County as well as The Dalles while making there permanent home in Douglas County. On one such visit to Oregon City, the local Indians became active and burned the Bushnell home with one hundred bushels of wheat. The family then moved to Oregon City for about four years but returned to Tenmile and remained. Linus Bushnell passed away at his home in North Tenmile October 5th 1891. The funeral was said to have been the largest ever held in the valley. His seven sons and two daughters were all present at the funeral. Lucinda passed away November 26, 1895 from stomach cancer leaving nine children, thirty-four grandchildren and nine great grandchildren. Linus and Lucinda are buried in the Tenmile Cemetery. 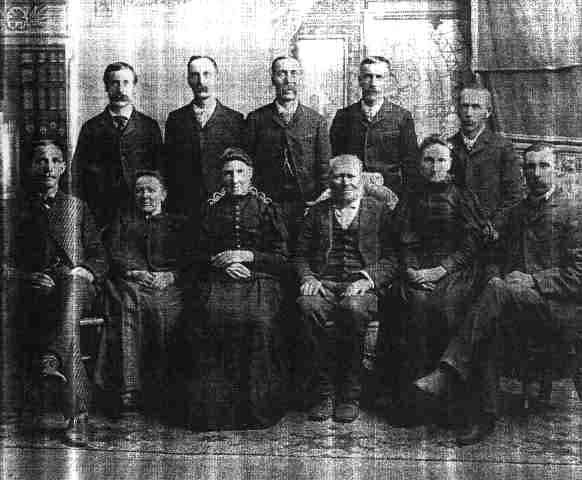 Many descendants of this family remain in Douglas County and Oregon in 1994. Beckwith Cook age 66, born August 12, 1785, Litchfield CT, the son of Selah and Lucy Beckwith Cook. Wife, Mary Polly (Pettingill) Rice Cook age 61, born Feb. 04, 1790, N. Yarmouth, Maine. This couple married Jan 21, 1841, Tipton, Iowa. Mary's first husband, William King Rice died Dec. 29, 1839 in Ottawa, IL. Beckwith Cook was first married to Sybil Olds. Son's Seley M. Cook and Joel B Cook, along with two daughters, Harriet Cook Cutlip, and Sophia Cook Smith made this journey to Oregon. Mary Polly Pettingill was married to William King Rice in 1814 in New York. He died Dec. 29, 1839 in Conway, Illinois. They had one son, Horace Rice and four daughters Lucinda Rice Bushnell, Ruth Rice Collver, Nancy Rice Cook and Mary Rice Cook on this journey as well. The only children listed with this couple in the 1850 census in Cedar County, Iowa was Seley Mansfield Cook and his family. It is believed they had no dependent children with them on the journey. Beckwith Cook filed DLC claim (# 1206) located in Lane County between Crow and Vaughn, Oregon (also referred to as Noti Valley during early years). Other families in this wagon train claimed land in the same valley. This couple later located near Buena Vista, Polk County, OR. Beckwith Cook lived to the age of 92 years and passed away March 7, 1877 and is buried at Jefferson, Oregon. Mary Polly, passed on at the age of 84 years, February 4, 1874 (her birthday), and is buried next to her daughter Nancy. Nancy B. Cook, aged 57 years, (wife of Seley M. Cook) passed away June 14, 1874, four months after her mother. Polly and Nancy are buried side by side at the Buena Vista Cemetery in Polk County, Oregon. Seley Mansfield Cook age 39 was born in Onondaga County, New York in 1812, the son of Beckwith and Sybil Olds Cook. It is probable he moved with his father and family to Portage County Ohio where he married wife Nancy B. Rice January 24, 1835. Wife Nancy B. (Rice) Cook, age 34, was born in New York August 15, 1817. She moved with her parents to Portage County, Ohio about 1820. (Nancy is a daughter of William K. Rice and Mary (Pettingill) Rice. 1. Chloe Amelia Cook, age 9, born Cedar Co. Iowa 1842, Md. 1. John Alva Harry, 1857, Lane Co. OR. 2. James Laird, 1875, Coos Co. OR. Lived at Brewster valley in Coos Co. Chloe passed away 1929, Coos Co. OR. 2. Martha Armenia Cook, age 8, born Cedar Co. Iowa, Md. Basil Nelson Longsworth, Aug. 5, 1859, Lane Co. OR. Lived near Jefferson OR in 1905. Martha died about 1930 in Hillsboro, OR at the home of her daughter Emma Denby. 3. Osmer White Cook age 4, born in Cedar Co., Iowa Oct 7, 1847. Md. 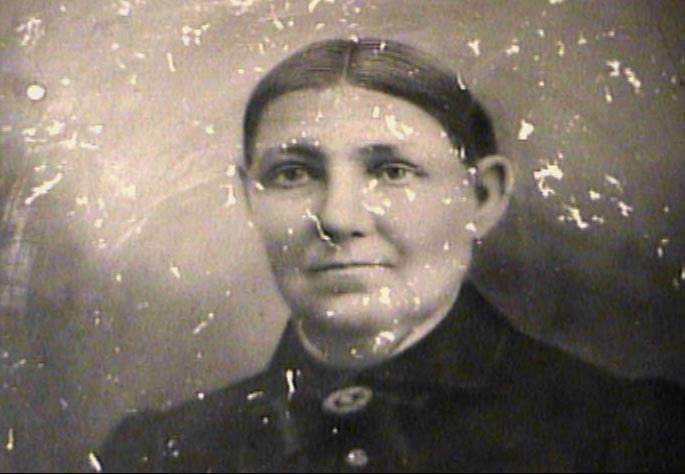 Mary Catherine Gilliam, October 12, 1873 in Wasco Co. OR. He died Mar. 7, 1920, Wasco Co. OR. 4. Mary Elizabeth Cook, an infant, born in Iowa 1851, Md. Isaac Connett Dec. 20, 1874. Lived in Polk Co. in 1905. She died 1937, Buena Vista, OR and is buried there. 5. Horace Howard Cook, born on the plains or Utah winter camp in 1852. He was not mentioned in his father's obituary 1905 so may have been deceased by that time. He may have lived in Lane Co.
5. Edward Alonzo Cook, born 1854 in (Lane County?) died after 1905. 7. Nelson Jasper Cook born after 1860. The family remained in Lane County until sometime after 1860. It is believed the family relocated to the Buena Vista/Jefferson area. Seley Mansfield Cook was a farmer and a minister. 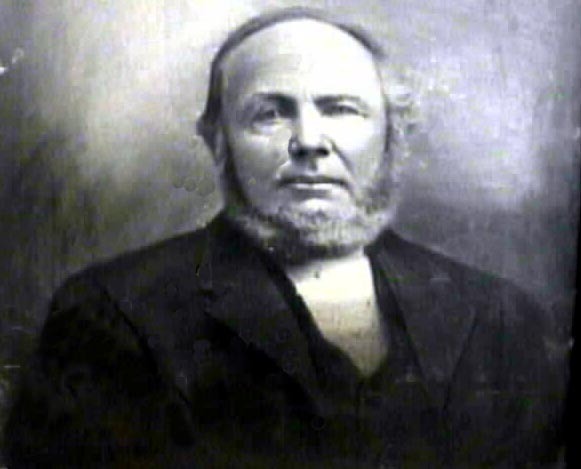 He performed several marriage ceremonies in Lane County between 1854 and 1866. . One marriage was William Johnson and Alvira Cook, a daughter of Joel B. Cook, on July 23, 1854. Seley M. Cook passed on Nov. 9, 1905 at Jefferson, OR. For 72 years he was a faithful minister of the Protestant Methodist church. He is buried at Jefferson, Oregon. Nancy B. Rice Cook, aged 57 years, passed away June 14, 1874, four months after her mother. She is buried next to her mother at the Buena Vista Cemetery in Polk County, Oregon. 1. Alvira M. Cook, age 11, born Mar. 8, 1840, Illinois. Md. 1. William Johnson, 1854 Lane Co., he died 1856. OR. 2. Daniel Cushman, Feb. 21, 1857, Lane Co. OR. 3. Joseph K. Sturdevant, June 3, 1862, Lane Co. OR. Alvira M. Cook Johnson Cushman Sturdevant died 1863. 2. Lucy A. Cook, age 8, born Cedar Co. Iowa, Md. 1. Lorenzo Granby, 1858, Linn Co. She married 2. Anderson Wright, May 6, 1866 in Coos Co. OR. A son, Joel B. Wright was born May 24, 1867 and Lucy may have died July 9, 1867 in Lane or Coos Co. The 1860 Federal Census for Lane County listed the following as members of the Joel B. Cook household (#904). 1. Seley C. Johnson, age 4 years probably the son of William and Alvira Cook Johnson. 2. Lorenzo Granby age 26, farm labor and born in Ohio. A family story is Lorenzo, was killed at Noti by Indians. This would have occurred after 1860 census if it did in fact happen. 3. Lucy A. Granby age 16, housewife, born in Iowa. The story continues, after husband Lorenzo was killed, Lucy and son Hiram rode horse back from Noti to Sitkum by way of Coos Bay Wagon Road. The Granby's established a home in the near vicinity of the Alfred. B. Collver home. 4. Hiram B. Granby age 1, male, born in Oregon. Joel B. Cook, died Jun 29, 1867, Coos River, Coos Co., killed in a logging accident falling timber. Wife Mary E. Rice Cook married Rev A.M. Walker, of Wasco County about Apr 26, 1873. 1. George W. Rice, male, age 1, born Iowa in 1850, Md. Ella Southern, about 1880 at The Dalles, OR. 2. Charles Wesley Rice born Lane County, Oregon Mar. 16, 1854, Md. Anna Evangeline Barnett, of The Dalles, in Wasco County, May 29, 1876. 3. Emma Adaline Rice, born Feb. 16, 1856 in Lane County, Oregon. Md. Charles Southern on Nov 4, 1878 in The Dalles, Wasco County. 4. Amelia Amanda Rice born about 1858 in Lane County, Md. Lemuel Gassaway. She died Jan. 4, 1885. 5. Austin C. Rice, born 1865 in Wasco County, Oregon, Md. Ada Waller, Nov. 11, 1890 at The Dalles. 6. Maryetta Margaret Rice, born Fifteen Mile Creek in Wasco County, July 26, 1868, Md. #1. Martin M. Waterman of Wasco County and #2. James Duncan in 1917. 7. Nellie Dorcas Rice born Wasco Co., Md. Daniel Mann of Collins Washington. Horace Rice sold his DLC in the valley and removed to Wasco County where he took a homestead and purchased railroad land until the estate was one thousand acres. He located on Fifteen-Mile Creek in 1863. His home was near what is now Rice Station on Fifteen-Mile Creek in Wasco County named for Horace Rice. Horace Rice was the first farmer to ever plant wheat in the uplands near The Dalles. After his successful crop, others began planting in the uplands. Horace Rice may be noted as the leader in opening up the hills of Fifteen Mile Creek to farming. Horace Rice, Absalom Bolton, Daniel Bolton, Alfred Collver and John Harry may have separated from the rest of the travelers at Bridger, Wyoming and went on to Oregon in the fall of 1851 arriving in Oregon City Oct 20, 1851. "The trip in the fall was a trail of many hardships and suffering. The parties food was gone and when they arrived at Fort Boise, they traded a portion of their bedding for dried salmon skins prepared by the Indians. They dug roots, ate hazel nuts, and rose balls to keep themselves alive till they reached The Dalles. At Umatilla they helped the Indians butcher a steer which was shared with them and they had enough meat to last several days. At The Dalles, there was a trading post and a tent. Some of this party may have traveled from The Dalles down river to the Cascades (falls) on the steamer Flint. From there, to the Big Sandy, by bateau. Judge Taylor drove them from there to Milwaukee. Mrs. Rice obtained work at one dollar per day cooking in a boarding house. Horace worked for two dollars fifty cents a day at a sawmill. He later made from ten to forty dollars a day handling wood and timber. While in this area, Typhoid fever attacked his family and they moved on to Lane County where they settled there claim August 12, 1853". Mr. Rice was a staunch Republican and held offices of county commissioner, justice of the peace and various offices both in Wasco county and the valley. Horace Rice passed away at The Dalles in Feb. 1915. His wife Elizabeth passed on three months later in May 1915. 1. Henrietta Mathilda Collver, age 3, born Aug. 7, 1848, Cedar County, Iowa, died May 28, 1917 in Marshfield, Oregon. She lived with her parents and relatives and never married. 2. Ansel Mark Collver, infant, born 1851, Cedar County, Iowa, Md. Dora Catherine Swift McCullock Sep. 20, 1899 in Douglas Co. Oregon. 3. Adelia Emily Collver, born January 17, 1852, on the Oregon Trail in Provo or Salt Lake City, Utah. Md. Isaac Jamison Powell. 4. Arthillo Monroe Collver, b. Oct 21, 1869, South Coos River, Coos Bay, Oregon. 5. Orace Gabriel Collver, b. Feb. 16, 1854, West Lookingglass, Douglas County, Oregon. He moved to Eastern Oregon and founded the town of Culver. 6. William Albert Collver, b. May 5, 1855, Melrose, Douglas County. OR. Married Neomi Steinon, b. Kansas City. 7. John Truman Collver, b. Feb 15, 1857, Noti Valley, Lane Co. OR. Married Emma Armfield. 8. Andrew Freeman Collver, b. June 26, 1863, South Coos River, Coos Co. OR. Married Clara Williams b. Douglas Co. Or. Oct 27, 1871. 9. Arthur Howard Collver, b. 1867, South Coos River, Coos County. The Collvers had 11 children, Mary Philura Collver was born in Cedar County Iowa and died from Scarlet Fever when about two years old before 1850. Donation Land Claim records show Alfred Collver arrived in Oregon, July 1851. He claimed DLC # 291near Lookingglass OR. His wife Ruth had a child born Jan 1, 1852 in Utah. If Alfred arrived in Oregon in July 1851, his family was still on the trail. Date of arrival maybe in error or he may have traveled ahead of his family. Horace Rice, Absalom Bolton, Daniel Bolton and John Harry probably did leave the main party in Wyoming and arrived in Oregon City in Oct 1851. It is more probable that Alfred arrived in July 1852 as that is the time the main party arrived. Other information indicates he had 28 head of oxen he drove from the East and was offered 620 acres of land in East Portland in trade. He did not make the trade and moved further south to Douglas County. Alfred Collver first settled in Douglas county. A Collver family story passed down through the generations is, in 1854; Alfred Collver was on his way from Lookingglass to the gristmill in Tenmile when Umpqua Indians attacked the party. Alfred became separated from the others and possibly lost. He made his way to the Rouge River and then followed it to the coast. He then made the trek north to what was then Marshfield where the first cabin was being built at the time. He liked the country. He returned to his home near Lookingglass, and four years later moved his family to the area. In the four months he was gone from home his family did not know if he was alive or dead. Alfred Collver moved his family to Stock Slough in Coos County near the South Coos River in 1857. He purchased a herd of cattle near Roseburg and drove them over the Roseburg Trail to Coos County and these cattle were some of the first in Coos County. He is also credited with being one of the first to plant fruit trees in Coos County. He assisted with starting the first school and church privileges in the county as well. Alfred Collver passed away while on a trip to Buena Vista, OR. May 7, 1902. Ruth Rice Collver passed on September 19, 1903 in Coos County, OR. Extensive information can be found on the Collver Family at the Dennis Collver Homepage. 3. Mark D. Cutlip, June 16, 1857, Oakland, Douglas Co. or Linn Co. OR. Md. 1. Mattie M. Haskin, May 4, 1884, Coos Co. 2. Marthena M. Wilkins, 1900, Coos Co. Mark d. 1931 probably in Oregon. 4. Elma Almira Cutlip, July 1860, Oakland, Douglas Co. OR. Md. William Bonebrake, June 20, 1880, Coos River, Coos Co. OR. She d. 1946, Coos River, Coos Co.
6. Sherman B. Cutlip, b. July 29,1870, Coos River, Coos Co. OR. Md. Anna Laura Smith, July 4, 1891, Coos Co. Sherman d. Mar. 17, 1943 in Marshfield, Coos Co. OR. This family remained in Lane County about one to two years then relocated to Douglas County near Oakland then to Coos County. In Coos County he took up a claim of 160 acres on the S. Fork of the Coos River. He lived with his family on this property for about 10 years then sold out and settled on Daniels Creek where he filed on a homestead where he continued to live until he retired from business. Sometime after his retirement he lived in Douglas County then went to California for awhile before returning to Daniels Creek where he died at the home of his son Sherman in 1910. His wife Harriet passed away Apr. 11, 1895, Coos Co.
4. Ada age 1, b. OR. 5. Dee Lee, became a farmer in Wasco Co. (maybe same as #2 Derbella), md. Margaret Pratt. 6. J. Park Bolton, became a farmer in Wasco Co.
7. George became a druggist at Moro and/or Lebanon, OR. 8. Dean, a harness maker in The Dalles. 10. A. Grant, a farmer near Rice in Wasco County, md. Cora Terry. There are questions to be answered regards names of children. There is some question this writer has regarding dates and written information about the Bolton and Rice family travels to Oregon. DLC records show Absalom Bolton arriving in Oct. 1852. It may be the recorded year 1852 is should be 1851. The History of Wasco County by McNeal states "Absalom Bolton, brother Daniel Bolton and Horace Rice family all came west on the same ox team train of 1851, all nearly starved to death together when they run out of provisions and had to eat fish skins, rose-buds, roots, suffering great privations,……. " It may be that Daniel Bolton did arrive in Oregon with the families and returned to the east to marry. The Absalom Bolton DLC claim is located at what is now (1999) the South West part of Veneta, Oregon. Bolton Road takes off Territorial Road in Veneta and travels Southwest to the Crow-Vaughn County Road. Bolton Road provides access from Territorial Road in Veneta to the former claims of S.M. Cook, B. Cook, J.B. Cook, Rice, Cutlip and Smith. Absalom Bolton remained in Lane County and received title to his claim. He sold his property and relocated to Wasco County at about the same time as Horace Rice. He settled in the vicinity of Boyd and became a well to do and prominent citizen of Wasco County. In 1860, his brother Dan Bolton and family were listed in the same household in Wasco Co. Child of Daniel and Elizabeth Bolton, Ellen, age 6, listed as being born on the plains. This would appear that Daniel Bolton crossed the plains in about 1854. Daniel Bolton is listed in DLC records as arriving in Oregon, 14 October 1853 and settling claim # 4441 in Wasco County on 1 October 1855. Absalom Bolton died Feb. 21, 1903 at his home on Fifteen Mile Creek. Oliva passed on after her husband. Daniel Bolton, married Elizabeth ( ), 14 November 1845 in Cedar Co. Iowa. They are believed to be members of this wagon train. It is believed Daniel went to Lane County first and then to Wasco County or possibly stayed in Wasco County when moving through with the wagon train. Daniel Bolton is listed in DLC records as arriving in Oregon, 14 October 1853 and settling claim # 4441 in Wasco County on 1 October 1855. Claim affidavit signed by J. P. Brown and Peter Rudio before Justice of the Peace James A. Odell in 1866. There are a number of unanswered questions regarding Daniel Bolton being on this 1851 journey. Daniel BOLTON and his family are listed as members of this wagon train but more research is needed to verify that he was in fact on this journey in 1851. Henry Bishop Smith, age 27, born Dec. 10, 1824, Geneva, Greene Co. PA. Md. Sophia Alvira Cook, a dau. of Beckwith and Sybil Olds Cook born Sep. 23, 1828, Ohio. This couple married Feb 19, 1849 in Cedar Co. Iowa. The family arrived in Oregon June 26, 1852. He filed DLC # 1969 and settled the claim Aug 23, 1852. Affidavits signed by Abraham Cutlip and Seley Cook. The claim was located on what is now the Crow/Vaughn Road (also called Noti valley in 1850's) in Lane County. 1. Freeman Beckwith Smith, age 1, born Mar. 14, 1850 in Cedar Co. Iowa. Freeman died Jan 1, 1873 in Coos Co. OR. 2. Kansas H (probably Candace) Smith, born 1852 on the plains or near Provo UT. Md. Daniel E. Thomas, in 1869 (or Oct 30, 1872) at Buena Vista, OR. She died in 1876 at Prineville, OR. 4. Charles Sumner Smith, born about 1857 in Oregon. (Lane Co?). Md. Lydia ( ) and she died in 1898 at Boyd, Wasco Co. Oregon. He died about 1931 in Battleground, WA. 6. Henry G. Smith b. 1865, Lane Co. Md. ( ) Jeffcott. He was a manager at Warren Packing Co,. in Astoria and may have lived in Portland about 1932 and at Tualatin in 1951. 7. W. L. Smith, no dates. In 1926 he had a dairy farm in Wasco Co. and later moved to Battleground WA. This family was in Lane County during the 1860 Federal Census. Henry B. Smith died near Noti in 1865. After Henry died his wife Sophia, sold the farm and moved the family to Buena Vista where her father and other family lived. Sophia Cook Smith married 2. James M. Allen Mar 6, 1875. 3. Jesse Clark Orchard, June 1888. Sophia passed after 1902 and is buried at Dufur, OR. 1. Even Neva Harry b. aft. 1858. Md. Pheba Turner, probably Coos County. 3. Grant W. Harry, b. 1864. Md. Hannah Krewson. 4. Oscar Colfax Harry, 1869. Md. Nellie Norton in 1902, Coos County. 5. Nancy Belle Harry b. 1865. Md. James D. Laird in 1881, Coos County. From a newspaper article in the Myrtle Point Herald, Myrtle Point, Oregon, Thursday, Apr. 14, 1949 about John A. Harry. "Back in the year 1852 when wagon trains (prairie schooners), drawn by oxen, were the only means of transportation between the eastern states and the great unknown wilderness of the West, among the hardy men and women who made up a certain wagon train from Iowa was a gangling boy of 18 years who was doing his "manfullest" best at "bull-whacking" and doing night guard duty to protect the train from possible attack by unfriendly Indians and other dangers that lurked on the trail of the pioneers. Also in that same wagon train was a young girl of 11 years by the name of Chloe Amelia Cook who was destined to become the life-partner of the gangling boy. In later years Chloe Amelia had many interesting stories to tell of her experiences coming across the plains, carrying water and gathering "buffalo chips" for fuel." "John Alva Harry and Chloe Amelia Cook were married in 1857 in Lane county, just five years after their hazardous trip across the plains in the wagon train, he being 23 and his wife only 17. They moved at once to his land claim on the Coquille river, near Myrtle Point. They made this trip on horseback and, months afterwards, small bits of her dress could be seen where they caught on the wild rose thorns along the narrow trail over Sugar Loaf mountain. Mr. Harry was a resident of what is now Coos county three years before getting married." "Oct. 4, 1854 - This morning Alfred Culver, Liness Bushnell and myself started to the Coquille river to look for land claims. Stopped over night at Mr. Day's in Camas Valley. The weather toward noon was cloudy in southwest. At sundown commenced raining gently. John A. Harry made his land claim, #300, Coos Co. OR. He arrived in Oregon 15 Oct 1851; Settled Claim on 4 April 1855 on the Coquille River, at Kitchen Prairie, up the river from the present Myrtle Point. John A. Harry became the first assessor of Coos County, when the courthouse was located at Empire. He led the party that discovered Brewster Valley. The family settled at what became known as the Half Way House, on the Coos Bay Wagon Road. In June 1874, John A. Harry, while on one of his trips to Empire (Coos Bay) for supplies, he became ill and died of pneumonia. He is buried at the old Empire cemetery. After his death, his widow, Chloe Cook Harry married James Laird of Coos Co. in 1875 and they had four sons; Walter M. Laird, Joseph L. Laird, John. H. Laird and Carl E. Laird. Some references maybe subject to Copyright laws. 1. Illustrated History of Central Oregon, published 1905. (See Horace Rice page 306 and Absalom Bolton page 307. 2. History of Wasco County, by McNeal. Date published unknown. (Horace Rice and Absalom Bolton page 285). 3. 1860 Federal Census, Lane County, OR (Long Tom Precinct). 5. Oregon Donation Land Claim Records Abstracted From Applications By Genealogical Forum of Portland, Oregon. Volume I, II, III. Index Oregon Donation Land Claims Volume III. 7. WPA Writers Project, Reminiscences Of Southern Oregon Pioneers, Interview of Thankful Lucretia Ollivant. 8. Lane County Marriages, 1852-1869. 9. Pioneer History of Coos and Curry Counties by Orvil Dodge. 10. Genealogy of Della Bushnell. Helen Howard, unpublished, 1994. 11. History of Southern Oregon, by A. G. Walling, published 1884. 12. 1850 census Center Township, of Cedar Co. Iowa. 14. Interviews with Ralph Howard, born 1901, Tenmile OR. grandson of Linus Bushnell, interviewed 1980 to 1985. Interviewed by Rommie Walker. 15. Sophia's Clippings. Sophia's Clippings were pasted in a book called "Department of Agriculture - Report 1884". collected by Sophia Cook Smith Allen Orchard, who came on the Oregon Trail in 1851-52. (1). Provided to every settler or occupant of the public lands, American half-breed Indians included, above the age of 18 years and being a citizen of the United States or having made declaration to become a citizen, who shall have resided on and cultivated the same for four consecutive years, the quantity of 1/2 section or 320 acres of land, if a single man, and if married, or shall become married before December 1850, the quantity of one section or 640 acres, one half to himself and the other half to his wife. (2). That to all white male citizens of the United States or persons making declaration to become citizens, that between the 1st day of December and 1850 and the 1st day of December 1853, 21 years of age or older is granted 1/4 section or 160 acres of land if a single man; and if married, or shall become married within one year from the time of arriving in the territory, or within one year of becoming 21 years of age as aforesaid, then the quantity of 1/2 section or 320 acres, one half to the husband and one half to the wife. This letter was provided by Barbara Love Cady in September 1999 to Rommie Walker. Barbara is a descendant of Seley M. Cook and Nancy B. Rice who made this 1851-52 journey to Oregon. Barbara included this note with the letter. "It was sent to me (copy of it was) from Dorothy Bolton Bunker who lived in Tipton, IA (about 22 years ago, now deceased). She wrote then, "Sometime ago, I did some research on the Ford family. There are so many still living around here and some say related a way-way back.
" January 20, 1865 Dear friends and old neighbors, I embrace the present opportunity to inform you that we are all alive and enjoy a reasonable portion of health and hope these few lines will find you enjoying the same blessing of kind providence. I received and read your thrice welcome letter which came to hand June the 15th. I am ashamed that I have not answered it before, please excuse me this time and I'll not treat a good neighbor so unkindly. eggs are 15 cts per dozen corn is $1.00 per bushel wheat $1.00 oats $1.00 potatoes 50 cts. peas $1.00 beans $1.00 per bushel. I have given you the prices of things in Oregon as near as I can. I would like to have you return the compliment. We have had a very hard cold winter this far for Oregon from Christmas to New Years it was nearly Iowa weather. We had cold rains for Oregon before that and since. We got a letter from Linnus Bushnell last week he and his family went back to Oregon City last September and they heard of the Indian outrage at Umpqua and did not return they have had nearly all of their housenstuff burnt by the Indians. Lucinda wrote that she had Franklin's children ataking care of them this winter and that Franklin had just returned from the Wallawalla country he had been there to drive a team for the soldiers she wrote that he was well and harty. She said that he intended to have come up here with them last fall had they not heard of the Indian trouble the Indians are very hostile here now they are fighting North and South of us they have had some severe battles both ways and the war is not broke up yet and it is generally thought that we shall have a bloody summer whoever lives to see it and I think if the Indians do not run out of provisions and ammunitions they will give the whites a hard brush. Daniel Bolton left here if I mistake not in August and went to the hills he left his claim it has been sold since he left for $100 and we have heard the Indians have stolen all his horses and he and his family are all forted up. Now I must tell you something about our fishing here in about three miles from where I live I can catch sammon that will weigh ten or twelve pound and from that up to twenty the stream that we catch them in is from 3 to 7 feet wide and from 2 to 5 feet deep we start from home in the morning and go over there and catch as many fish as we want and come back home same day. Now I must tell you how we catch them we have a large iron hook fastened to the end of a pole about 5 feet in length we stand on the bank and hook them out now I must tell you a little bear story and then close. Two men started one morning to work in the woods about 2 miles from here and one had a gun the other had an ax they worked all day and was returning home when they come to a thick brush they saw a bear killing a hog one of them shot the bear he then called his frightened comrade who was shaking like a quaking aspen to him he then reloaded and shot the bear again they then run and hollered to me to come and help catch a wounded bear. Abram Cutlip and I took our dogs and huried to the spot when to our surprise the bear lay dead on the hog he had killed it dead on the first shot. Now I must close by telling you that the friends here are all well they send their best respects to you and all the rest of the friends and neighbors I remain your friend truly. Joel B. Cook to Mr. Charles Ford"
give my respects to Mrs. Bradley and all the rest of the neighbors and keep the same to yourself. Joel want you to tell Orace Coolver not to be so fraid of ink and paper if he will write one letter it will be thankfully received and cordially answered. Please direct your letters to Long Tom P.O. Lane Co O.T." If you have information regarding these families and this Wagon Train please contact Rommie Walker., Eugene, Oregon.